Shad. That’s the word that’s on many Virginia anglers minds when the spring months arrive. Here in the state of Virginia, our major tidal rivers are home to the annual “Shad Run”. The Shad first arrive in the James River around the middle of March. They typically begin to show up in the Rappahannock a week later then the Potomac a week after that. The middle of April is usually the heat of the run across the state of Virginia. Shad mean different things to different people. To Bass Fishermen, they mean big bass are going to be very active eating big baits preparing for the spawn. To Catfishermen, they mean a very active Blue Cat migration up the rivers following their favorite food. Striper Fishermen know that when the Shad are in the river, so are the stripers and not just schoolies either (last year a 70lb. Striper was caught in the James near Richmond). What I’m going to touch on in this how-to is what they offer flyfishermen, and how we can catch more of these hard fighting fish. Shad are one of the closest relatives to Tarpon in the fish world. 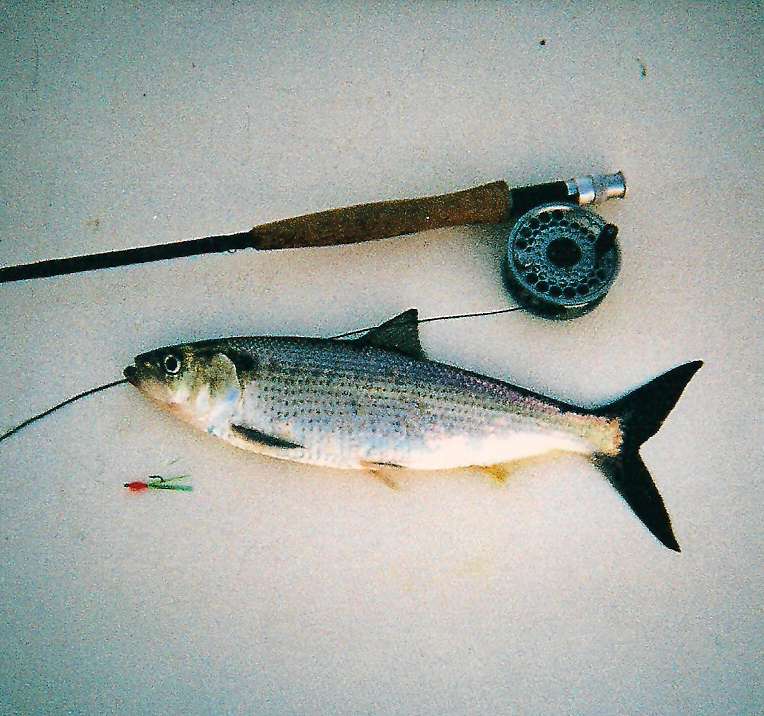 There are two species of Shad that make their migration up the rivers in Virginia. The more common of the two is the Hickory Shad. Hickory Shad can grow to a maximum of about 2.5 pounds. 90% of the Shad that we catch every year are Hickory Shad. The Hickory is definitely the more acrobatic of the two, sometimes jumping 10+ times before reaching the boat (nicknamed “The Poor Mans Tarpon”). The less common and much larger of the two species is the American Shad. Americans can grow to upwards of 10 pounds! Although 10 pounders are rare, 4-6 pounds is about the average size. Although Americans may not be quite as acrobatic as the Hickory, they are capable of producing reel burning runs and will fight you until the bitter end. Now lets get into what you’re going to need to catch these fish. There is a fairly wide range of rods you can use, depending on your skill level and how much fight you want the fish to put up, anywhere from a 5wt – 8wt. I would recommend 9ft long with a relatively fast action to accommodate the line you will be throwing. As for reels, to be honest they are not that important in shad fishing. If I had to choose I would probably still go to a large arbor with a fairly smooth drag due to the off chance that you can hook a large American or even a striper who felt like eating your fly. Now for the most important part of your entire shad fishing arsenal, the line. There are a couple of options out there for fly lines that will work for shad, and it all depends on where you are fishing. Here in the James I like to use either a full fast sinking line (7-9 inches per second) or a 20+ foot streamer tip fly line matching the grain weight of the tip to the rod size you’re throwing. For example, a 200 grain sink tip can be thrown on a 6 weight, a 250 grain tip for an 8 weight and 300+ is usually reserved for 9 weights and up but I have thrown them on my 8 before without too much trouble. You also want to make sure the streamer tip fly line is 7-9 inches per second sinking, over the years this has been my favorite for the James. With sinking lines, be sure to only use a 1-3 foot leader of fluorocarbon to avoid a lag in the leader resulting in missed fish. I also fly fish for shad in the Rappahannock in Fredericksburg. This is an opportunity to wade for these fish, (in the James it is almost exclusively boat or kayak fishing). 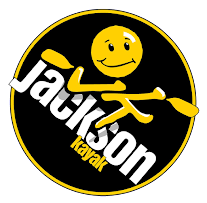 So if you do not have access to a boat or a kayak, the Rappahannock might just be for you! The Rappahannock is much shallower than the James and usually I just use a full floating line with about a 10 foot fluorocarbon leader. I attach the leader to the fly line with some BRIGHT monofilament; this acts as a makeshift indicator and is easy to see as you drift the fly through the channel. Most of the Shad fishermen in the Rappahannock are around the Route 1 Bridge. This is probably the best spot for catching them, but I would recommend going on a week day because it can get crowded. This is arguably the least important part of your entire lineup. Shad are not “feeding” during the run. When they hit a fly it is simply a “that’s in my way, better kill it” kind of hit. Since shad are 100% sight fish, they will have to be able to see the fly in order to hit it. Just make sure to use a color that contrasts against the water color to allow them the best chance to see it. In dark water I tend to use darker colors like purples and reds. In clear water, it doesn’t matter what you throw, as long as it’s bright or shiny. I tend to use size 8 hooks for all my shad fishing, and most of my flies have a marabou tail just because as a fly is drifting, a soft material like marabou has a lot of movement and action. The good thing about the Shad Run is its very hard to not catch fish on a fly rod. Pretty much regardless of where you go, if you experiment with your retrieve and depth you will find them, but I will explain my technique for locating the fish. Shad like to have some sort of current break. They have made a long journey up the river thus far and will always welcome a place to rest up. So places like wing dams, jetties, channel edges and abrupt changes in bottom contour can offer these shad a nice place to stack up and rest. Once I have located an area that looks promising, I tend to cast my fly line perpendicular with the current, allowing the current to slowly pull it down stream swinging the fly directly behind me. The trick to finding fish is changing up the amount of time you allow the line to sink before you begin to strip it in. Start out around 4 seconds, then allowing it to sink longer until you find the fish. Once you find the number, continue to do the same thing, you will get hit on nearly every cast until the school moves in the water column and you’ll have to find them again. The way I prefer to strip for these fish is fast short strips, just a “wrist flick” strip one right after another at a fairly quick pace. Be sure not to try and set the hook with the rod, you have a lot of heavy line in the water and that could damage even the strongest of fly rods. I like to strip set shad, just a quick, hard full arm strip as you feel the hit. This will protect your rod and also if you miss the fish, you will probably get hit by another because you haven’t moved the fly out of the strike zone. I believe I have covered just about everything I can think of in this how to for shad fly-fishing. These fish are a great way to kick off a season of fishing. They fight hard, jump like crazy and allow you to dust off the gear that’s been gathering dust all winter and catch potentially over 100 fish a day! I think that’s what makes them so fun, because for some anglers it’s the first time they have been out since the Fall. If you have any questions about something I didn’t cover or any questions about this post, leave a comment and I’ll be sure to help you out. For the time being, start pulling out that fly rod and get ready to tear up some Shad! See you on the water! If you want to be real angler you should need some essential fishing gear. When you want to go fly fishing, fishing gear is very important for angler.